Living Room in the Style of the Modern English School, a painting by I.T. Frary, reproduced in The Illuminator, June, 1909. Collection of Western Reserve Historical Society, Cleveland, Ohio. I'm curating an exhibit for the Cleveland Artists Foundation, Designing History: I.T. Frary; Interior Design and the Beginnings of Historic Preservation in Ohio. Frary is best known as the author of Early Homes of Ohio, the first book to address this state's architectural heritage. His first career was as a designer of furniture and interiors for the Brooks Household Art Co. Brooks became one half of the famed Rorimer-Brooks. [Living Room] a painting by I.T. Frary, reproduced in The Illuminator, June, 1909. Collection of Western Reserve Historical Society, Cleveland, Ohio. I was pleasantly surprised to find, in the I.T. Frary Papers at the Western Reserve Historical Society, a copy of The Illuminator, dated June, 1909. 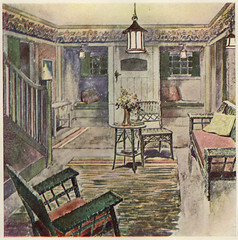 The magazine was published for the employees of the illuminating company, and used several of Frary's paintings for the Brooks Household Art Co. to illustrate a piece on various interior design ideas. [Colonial Style Hallway] and [Hallway], paintings by I.T. Frary, reproduced in The Illuminator, June, 1909. Collection of Western Reserve Historical Society, Cleveland, Ohio. This pair illustrate two very different ways that one might treat an entrance hall. The Colonial Style one, on the left, is far more formal, while the one on the right is more casual. 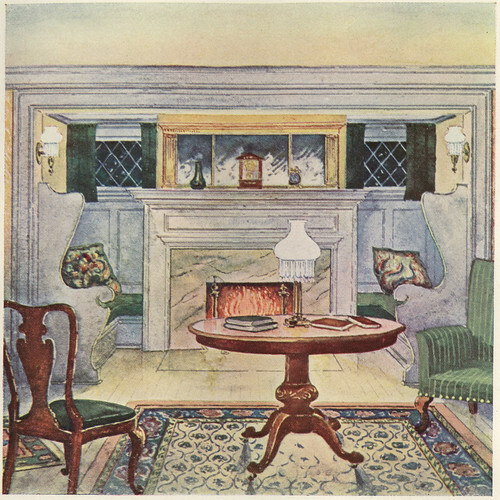 Living Room in the Style of the Greek Revival, a painting by I.T. Frary, reproduced in The Illuminator, June, 1909. Collection of Western Reserve Historical Society, Cleveland, Ohio. 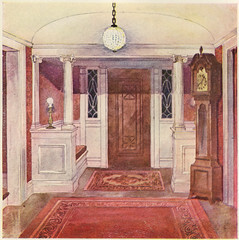 This view, Living Room in the Style of the Greek Revival, like the lead image, Living Room in the Style of the Modern English School, illustrates the level of detail that Frary, as a designer, might put into a room. Some of the furniture would have been his designs, while other elements would be carefully selected antiques. It's not clear where the houses in these renderings were located, or even if they were built. Given the number, I would guess that at least one had been executed. However, the firm's commissions in Cleveland were almost entirely on Euclid Avenue, and so are likely lost. I'll delve further into the Brooks Household Art Co.'s commissions in a future post. 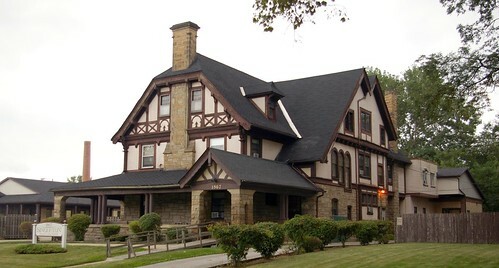 The Edwin Tillotson residence is a Tudor Revival structure at 1867 East 82nd Street, in Cleveland, Ohio. It was built in 1902-3. Meade and Garfield were the architects. The Tillotson residence is one of the few remaining local structures for which the Brooks Household Art Co. did work. 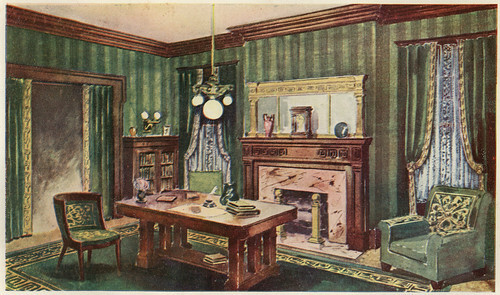 Perhaps Living Room in the Style of the Modern English School was for this house - or perhaps it was for one in Chicago or St. Louis. I haven't had a chance to look inside yet - but I suspect that it has been significantly modified over the years. Still, it's worth further investigation. Do any of these look familar to you? The exhibition Designing History: I.T. Frary; Interior Design and the Beginnings of Historic Preservation in Ohio runs through July 16. I encourage you to take a look. The Cleveland Artists Foundation is located at 17801 Detroit Avenue, in Lakewood, Ohio.